The porous structure floats on the water and draws up water through its pores, where it evaporates into steam. MIT claims that the new material is able to convert 85% of oncoming solar energy into steam, loses little heat in the process, and is made up of relatively low cost materials. And its the most efficienct solar thermal harvesting method reported so far, requiring a solar intensity of about 10X that of a sunny day versus 1,000X for current methods. “Steam is important for desalination, hygiene systems, and sterilization,” says Hadi Ghasemi, of MIT’s Department of Mechanical Engineering, who led the development of the structure. “Especially in remote areas where the sun is the only source of energy, if you can generate steam with solar energy, it would be very useful.” Click here. A representative structure for localization of heat; the cross section of structure and temperature distribution. Source: MIT researchers. GE’s new solid oxide fuel cell breakthrough allowed the company to start building a new pilot fuel cell manufacturing and development facility near Saratoga Springs, New York. “The new system’s power generation efficiency can reach an unprecedented 65 percent. Overall efficiency can grow to 95 percent when the system is configured to capture waste heat produced by the process. The basic configuration of the system can generate between 1 to 10 megawatts of power” said GE. Click here. Construction began this week on a 2MW, $19.5 million carbon-capture pilot, funded in part by the U.S. DOE, in Louisville Gas & Electric and Kentucky Utilities’ E.W. Brown plant in Kentucky. The project is a partnership between LG&E, KU Energy and the University of Kentucky Center for Applied Energy Research. Click here. Last week, the DOE, in partnership with NRG Energy and Japan’s JX Nippon, began construction on the first commercial scale post-combustion carbon capture retrofit project in the US. When completed in 2016, the Petra Nova Carbon Capture Project will trap 1.6 million tons of carbon annually from one unit of NRG’s WA Parish power plant and pipe it 82 miles to the West Ranch Oil Field. 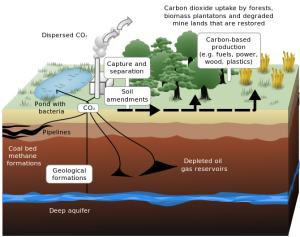 Read more about NRG’s Petra Nova Carbon Capture Project in an insightul article in Forbes.